A Michigan woman who killed a cyclist in a car accident has received a suspended sentence of two years, including 90 days in jail, and will not be able to use a cell phone for the duration of the sentence. Last September, Mitzi Nelson, 23, was driving outside DeWitt when she received a call on her cell phone. As she reached out to answer it, she hit 35-year-old Jill Byelich, who was riding on her shoulder in full protective gear. Byelich, a mother of two young children, died on the spot. "In the blink of an eye, a moment’s carelessness, a life was taken, something I'm certain at 23 years of age Ms. Nelson will relive for the rest of her life," said Judge Stewart McDonald of the Clinton County District Court. Jordan Byelich, the husband of the victim, came up to Nelson and hugged her before she was led away. "I don't think there's ever going to be a moving on from this, but we're going to do the best that we can to continue on with our lives," he told the media outside the courtroom. Byelich did suggest that Nelson be stripped of her mobile communication devices. "I don't think she has a right to have a cell phone, I think it's a privilege," agreed Judge McDonald. Nelson will also perform 150 hours of community service – much of which will be spent giving lectures to schools about her experience – and will pay over $15,000 in restitution to Byelich’s family. She will be able to serve most of her sentence during weekends and public holidays, and will be allowed to resume driving after her suspension runs out next May. Nearly three in five Michiganders admitted to using cellphones while driving, which is not illegal in the state, unlike texting at the wheel, which carries a $100 fine. More than 3,000 people are killed annually in the US by so-called distracted drivers, with many of those on the phone at the time of the crash. 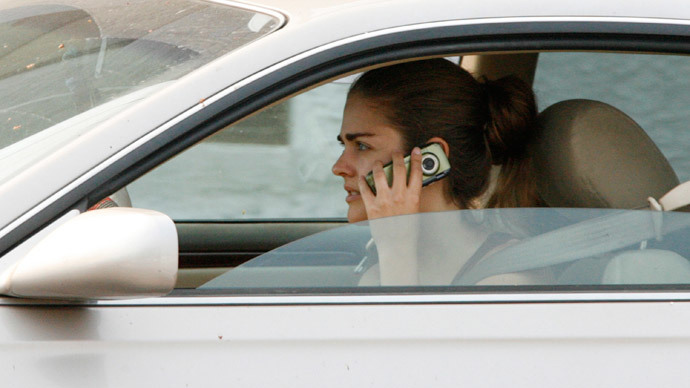 Laws concerning use of the phone while driving vary from state to state. In Utah, texting drivers involved in fatal collisions face up to 15 years behind bar, while many others get suspended sentences and jail terms of several months for killing multiple pedestrians. There have been campaigns in several states to ratchet up punishments, such as Jake’s Law, which was introduced in Maryland last year due to five-year-old Jake Owen being killed by a distracted driver in 2011. The driver was only fined $1,000 because he was not drunk, but would have face up to a year in jail under the new law.